This article is a tutorial that explains how to convert an audio CD to high quality MP3 files at no cost using Audio Grabber, a free CD ripper. Mp3 files are the de facto standard of music players including iPod music players, Nokia phones and all digital players. In addition, MP3 files can not be protected by Digital Rights Management. Windows Media Player 9 offers the option to convert to MP3 at a cost. Windows Media Player 10 allows it at no cost - but with not much customization. First, head to http://www.audiograbber.org/download.html and download Audio Grabber Audiograbber 1.83 (as of July 2010). You will also need the Lame Encoder for higher quality MP3 encoding. Click the link in the same page labelled MP3 Plugin and download the plugin labelled "MP3 plug‍in - download now! (version 3.98.4 - freeware)". You should end up with two files (depending on where you saved them). Let's install the main application first. Double-click the AGSETUP.EXE and follow default prompts. You should see the Audiograbber link in your desktop after your installation. We're not done yet. Now, before we launch the program, we need to install the Lame Encoder plug-in. This is as simple as double-clicking the ag_mp3_plugin_setup.exe you downloaded just now and installing it. 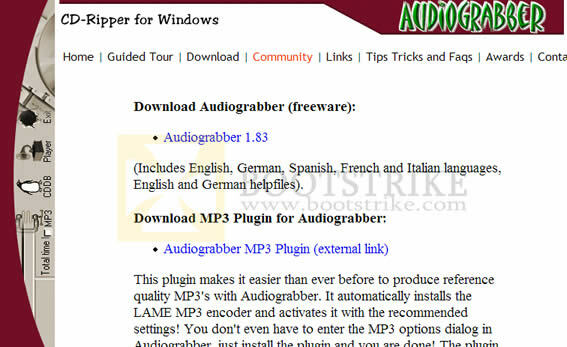 NOTE: The latest version of AudioGrabber MP3 Plugin comes with Kikin adware. Click on "No, Thanks" if you don't want this adware as this is NOT required. The Main Window. The usages of (1) and (2) will be shown below. Constant Bitrate: Select at least 128kbps. Select 192kbps for higher quality. Selecting more than 192kbps has little or no difference in quality. Click OK. The Mp3 button on the top should now have a checkmark. We're done configuring! The list that you see in the main window is the list of tracks. Place a checkmark on the tracks that you want to convert to MP3. If you see a blank list, ensure that you inserted an audio CD in your drive and perform a refresh by clicking on CD > Refresh Track List. Hit the Grab button after you are done and encoding begins! You will see the status of the encoding. Depending on the number of tracks, CPU speed and CD-ROM speed, this can take some time. After it is complete, you will be brought back to the main window. You can find the files in the C:\audiograbber folder. Edit the names and properties by right-clicking the file, and selecting Properties. Click on Summary and you should get the following screen. Click on the value column for the row you want to modify, add your text and click Apply. Your changes will be saved. Why does it take so long for the encoding to complete? MP3 encoding is a very CPU intensive process, as the program has to analyze bit by bit, decide which bit to discard and keeping track of the bits to use. Last Updated 7th July 2010. This document is Copyright(©) 2001-2010 by G.Ganesh. Unregistered Once cd is copied how do I transfer it to the MP3 player? Admin Administrator connect your Mp3 player in Mass Storage Mode. Go to 'My Computer' and there should be a new 'Removable Disk'. Copy the Mp3 files into there. Zed Unregistered Congratulation to the site, absolutely safe and usable tricks, good tutorials. Only one comment: As a recording engineer, i recommend the "Stereo" setting instead of "Joint Stereo" at the encoder settings. You will hear the difference in the higher frequencies. Treble section will be much clear (when you use joint stereo, you hear "shh" instead of clear "sss" sound, the difference is like a web radio compared to the original station - they use similar data - and quality - reduction), and the spatial image is much better too. Beside of these advantages, the file size increases only 2-3 percent. Venoth Unregistered Great tutorials. Im very happy now as I can convert my old LP's into mp3 format and listen to them on the go. Fantastic work. JP Unregistered Fantastic tutorial. Found this while looking at the uTorrent speedup guide. Can't wait to try it. Thanks. Hov Unregistered Works as good as it says.